You need Gorilla permit / pass to be able to take part in Gorilla trekking in Bwindi Uganda, Volcanoes Rwanda or Virunga and Kahuzi Biega for Lowland Gorillas in Congo. 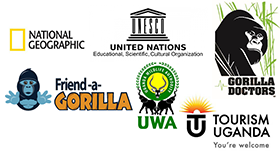 So, if you are wondering how to get a Gorilla permit Uganda or Rwanda & Congo Gorilla trekking permit, Gorilla Holidays Uganda Ltd is your ultimate answer! We will book your Gorilla permit immediately when you confirm your safari and provide relevant and accurate information for your trek and general travel information as may be required for the success of your safari. Booking a Gorilla trekking tour with us is a guaranteed way of getting a permit. Once we secure your permit, trekking with Gorillas will be guaranteed – you will see the Gorillas! It is important to note that Uganda and Rwanda gorilla permits are have a very high demand and quickly sell out most especially during peak / high seasons months of June, July, August, September, December, January and February. It is not unusual that permits can sell out several months in advance; for example, some dates in July and August 2018 have already sold out as I write this! Some ask; what is a Gorilla permit? It is simply a pass that allows you to do the trek to see Gorillas. This is issued by the park relevant authorities in the respective destinations and that is; Uganda Wildlife Authority (UWA) for gorilla permits in Uganda – trekking in Bwindi & Mgahinga, Rwanda Development Authority (RDB) for Rwanda gorilla permits – trekking in Volcanoes National Park and Virunga National Park Authority for Congo gorilla permits – trekking in Virunga and Kahuzi Biega. Your pass allows you to see, photograph and watch the Gorillas for up to a maximum of 1 hour in each of these destinations. You may be excited however, to learn about the possibility of watching Gorillas for up to 4 hours on a Gorilla habituation experience! This is only available in Uganda at the moment and only in the southern section of Bwindi called Rushaga for $1500 per person. You can contact us for more about Gorilla habituation experience. Cost of a gorilla permit? In Uganda, it costs $600 each, $1,500 each in Rwanda and $400 in Congo. Other options on how to get a gorilla permit include contacting the relevant issuing authorities directly but in many cases, you will be either disappointed or delayed! The issuing offices are always busy and you can call multiple times without anyone answering and you may wait 3 weeks to receive a response to your email! Even if you won’t take the whole package and only interested in booking a permit and taking care of the rest on your own, we are happy to help. Contact us. Copyright © 2019. Gorilla Holidays Uganda. All rights reserved.